Allow Our Team To Talk You Through The Choices! 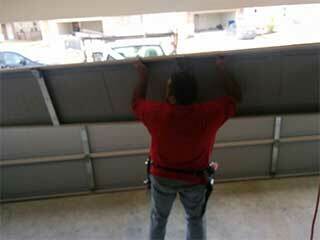 At Garage Door Repair Henderson we know how important it is that your door installation is performed to perfection. Our customers trust our company to provide them with excellent services that they can count on every time they call us for assistance. Curb appeal can be a big deal. A lot of homeowners, especially ones that are currently trying to sell their home, want their house to stand out from among the other ones in the neighborhood. They want people driving by to take notice and admire it. That's where we come in. We specialize in repairing and maintaining garage doors, but we can also replace your old one with new and more aesthetically pleasing options. So, where should you start? Well, the first thing to consider is what type of material you'd like to have your new door made of. Wood steel and aluminum each offer different advantages and disadvantages. If you're looking for curb appeal, you'll want to go for either wood or steel, as aluminum is often not very "eye-catching" and can easily become bent and damaged. Wood is considered the classic look, and can lend your home a very wholesome and endearing quality. However, it will require more frequent maintenance and regular repainting in order to be preserved better. Steel is extremely durable, and while rust can affect it, especially in more humid areas, it can also be applied with a protective coating to resist that. Steel can also come with a faux-wood exterior, which offers both beauty and brawn at the same time. After you've chosen a new door that matches your taste, the next step is getting it set up. This part is very crucial, as improper handling or amateur installation is not only dangerous but can lead to more serious and expensive problems in the future. Your safest bet is to get it done by professional technicians. Our experts at Garage Door Repair Henderson can help you find the best door for your home and then install it to perfection. If you'll require any maintenance or repair services, we'll be happy to come to your rescue quickly.